I was wondering whether that is actually true. 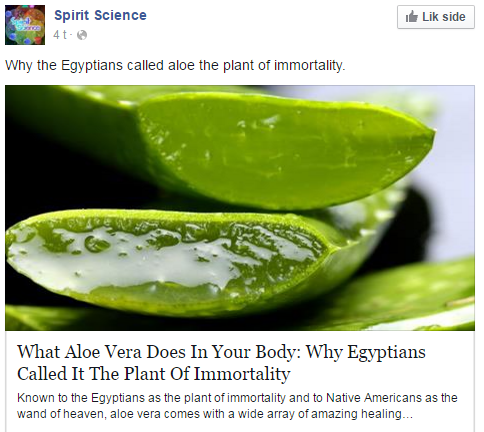 Did the ancient Egyptians call aloe vera (and possibly other related species) the "plant of immortality"? Is this something we can possibly know? Rudimentary google searches came up with three kinds of results: Either someone selling aloe products, or an article just like the one above, or some blog promoting hermal remedies and "natural living" in general. None of them are what I would consider trustworthy on the issue. Note: I do not doubt the claim that the plant was known to the ancient Egyptians (the plant probably originated from that part of the world, and herbal remedies are an old tradition), and I'm not asking about any medical effects it might have. It appears that through some kind of slow osmosis this turned into a myth about the "plant of immortality" in New Age pamphlets sometime around the 1970s or 1980s. In fact, I cannot find any evidence that we even know their word for aloe. I think this book's claim is based on a 1930 "translation" of the Papyrus Ebers by Cyril P. Byran, but that work seems to be considered highly suspect; it's a "'rendition into English of German and other translations of the Egyptian original,' is fragmentary, and is full of satiric editorial comment." John F. Nunn's seminal work Ancient Egyptian Medicine does not contain an entry for aloe in his table of herbs with "considerable agreement for the meaning of the Egyptian word," nor does it show up in E.A. Wallis Budge's dictionary of hieroglyphics. "Aloe" does not show up in the translation of the Edwin Smith surgical papyrus, and as above, its use in an early English translation of the Ebers papyrus was spurious. Not the answer you're looking for? Browse other questions tagged history consumer-products . Were “Ancient Astronauts” or extra-terrestrials responsible for the construction of Stonehenge? Did ancient Chinese frontline troops decapitate themselves to scare their foes? Are these gigantic stones in Russia from a technologically advanced ancient civilization? Did Ancient Roman bureaucrats file data only by year? Did ancient Peru use electroplating? Did Herodotus call Egypt the “Gift Of The Nile”?